Luminit’s Light Shaping Diffusers® enable many HUD Tier 1 manufacturers in the automotive market to produce sharp and bright images based TFT and projector based units. They allow the designer to customize the field of view of the display and despeckle the image for laser-based systems. Luminit Holographic Optical Element technologies for head-up displays use thin (10-30 micron) holographic photopolymer film that can be applied directly to car windshield displays or to reduce volume of under-dash optical components. The holograms recorded in this film have properties of thick (Bragg) holograms that are wavelength and angle selective with very low scattering. HOE film combined with an LED or laser light source allows a floating, transparent image to appear on the windshield without any obstruction of view. 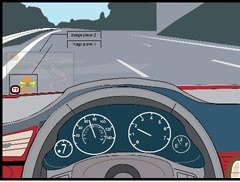 The driver does not need to focus on the image to view it or ever take his or her eyes off the road.